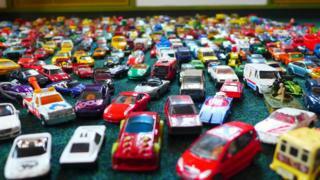 A campaigner is hoping to create a "traffic jam" of 25,000 toy cars in Bath in a bid to dissuade parents from taking their cars on the school run. Joanna Wright is collecting cars for an installation on show next month as part of a "Get out of your car" campaign. Research supported by the University of Bath suggests about half the cars on the city's roads at peak times during term time are on a school run. Bath and North East Somerset Council estimates the number is about 4,000. However, it said it was good to encourage a greener school run. Ms Wright, who co-ordinated the year-long study run in conjunction with the university, said people needed to think of "other ways" of moving around the city. "If you look at the data, there are approximately 22,000 [young people moving around the city] and we don't know how many other children are coming in and out of the city," she said. "So that's why I'm trying to collect 25,000 toy cars because I want to show people what that looks like if they all did use cars every day." A council spokesman said it was "not aware of the figure" quoted but agreed it was good to "encourage other ways to get to school". "Previous calculations on school traffic, which the council carried out last year, estimated around 4,000 vehicles associated with the school run each day during term time - this is out of around 40,000 vehicles at peak morning times," he said. "To encourage more families to find greener ways to travel to school we have a number of schemes like the walking bus, scooter pods and bikeability." The toy car installation is due to go on show as part of the Fringe Art Bath Festival from 25 May.